This is kind of a pile of odds and ends that happened over the last week. Since that's how it's been a lot lately. 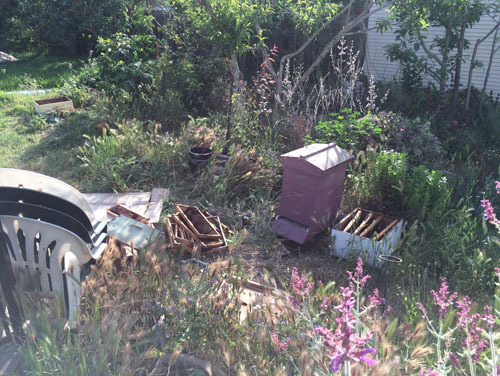 Last weekend we kicked the swarm of bees out of the old stack of equipment they had moved into. They were remarkably sanguine about it, but then again, they were a swarm (swarms are pretty mellow). And we did give them a nice new home that had a roof and a floor and wasn't full of snails, so there is that. Fortunately, they seem to like the new equipment we moved them into, and all is well. 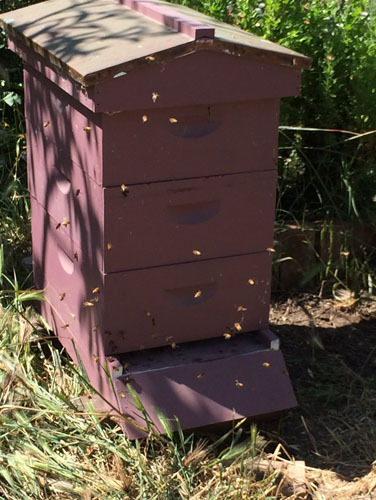 Next up is moving their new hive, slowly, out of the main pathway to the back yard. Since it's a little irritating to have bees running into you all the time even if you are not scared of them as most people are. 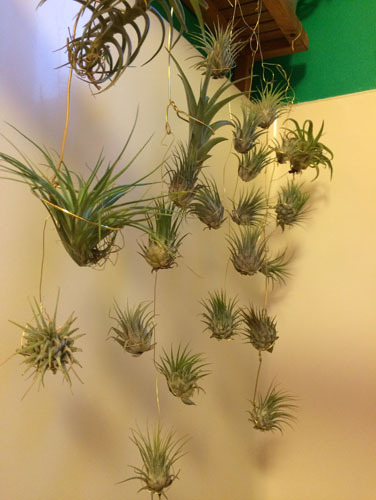 I made some wire things to hang my air plants from. Since they hang in the shower it is easy to water them (they need regular watering) by just giving them a spray when I take a shower. The windows in the bathroom face south so there is lots of light in there. Wednesday was the 2-year anniversary of my stroke. 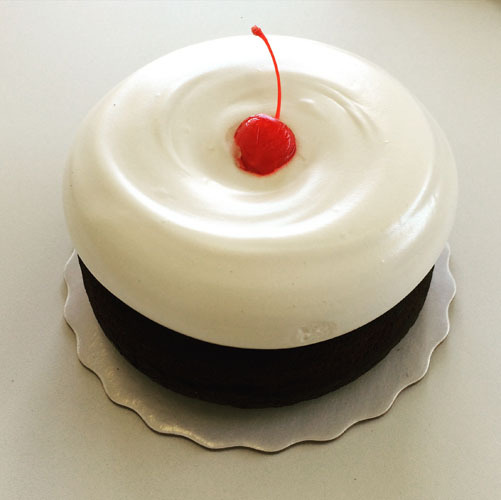 I got a cake for the office. It was awesome as always. Also awesome is to be alive and healthy. If you must have a stroke, having the kind I had is how you should do it, even if it does require some foresight in terms of arranging congenital vascular irregularities. Though I recommend against strokes in general, because in case nobody ever told you, they hurt a LOT. 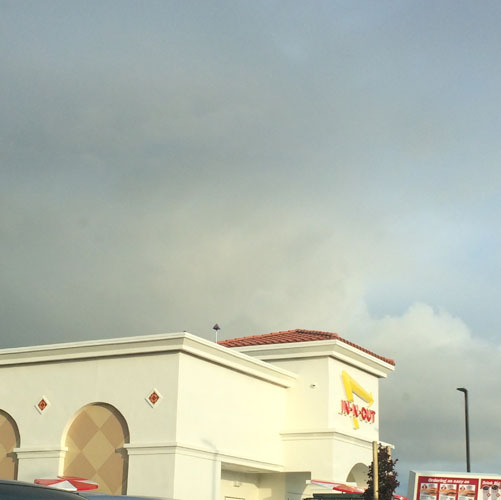 The new In-n-Out on the island opened up this week, so we went for dinner on opening day just to be Those People. There were a lot of people there, but they had it under control. We eat at In-n-Out maybe every other month, so this is not going to make a huge difference in our lives, but it is nifty. I wish they had a bike-up window, but they are not that kind of restaurant. 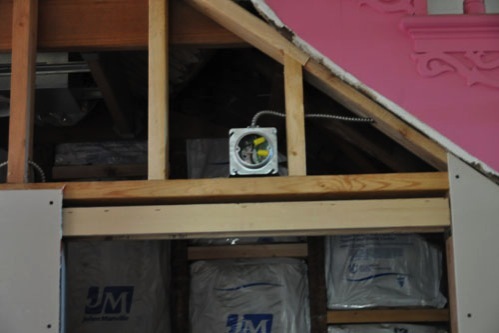 Noel wired up the box for the best part of the new powder room: when you turn the light on inside, an "On Air" light will go on in the hall, so you can tell there is somebody in the bathroom. Also because it is funny. I'd like something like the on-air light at a radio station I worked at in the 80's, but nothing that looks like it is available, so it will probably be something kind of simple. I spent much of this weekend washing junk wool to stuff dog beds. This is one of a pair of truly terrible fleeces I got for very cheap at the end of a wool sale; they were full of hay, dirty, stained, and generally not sheared well, so they didn't sell. I wanted them for stuffing rather than spinning, so the price was right. I gave them a minimal wash to get the actual dirt out of them, picked out the sheep poops (really, seriously?) and they are drying outside now. 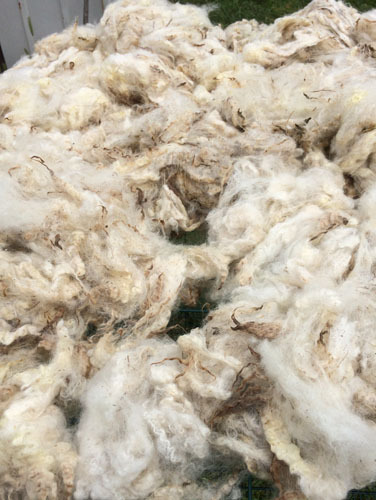 Then the dogs will get a bed stuffed with some sheepy wool. Just perfect. And finally, the pink mulberry tree is ripe. After I braced myself for a terrible cherry harvest, this was a pleasant surprise. 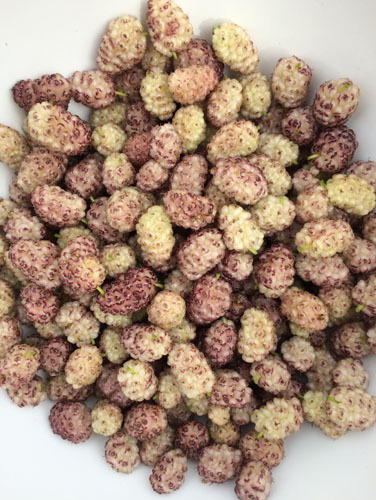 They taste like a lighter version of a regular mulberry, and they don't turn your entire body purple, and they don't attract birds as much.